Ariana Grande was among the many performers at Aretha Franklin’s star-studded funeral in Detroit yesterday. 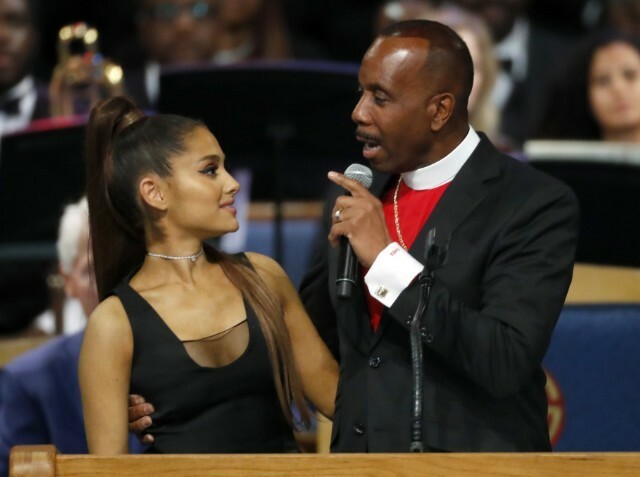 After singing “(You Make Me Feel Like) A Natural Woman,” Grande was greeted onstage by the bishop officiating the service, Charles H. Ellis III, who joked, “When I saw Ariana Grande on the program, I thought that was a new something at Taco Bell.” Images and footage of the interaction showed Ellis’ hand seemingly holding the side of Grande’s chest, and many took to Twitter to call him out for inappropriate touching. “The last thing I want to do is to be a distraction to this day. This is all about Aretha Franklin,” Ellis added. He also apologized for the Taco Bell joke about Grande’s last name, saying, “I personally and sincerely apologize to Ariana and to her fans and to the whole Hispanic community. When you’re doing a program for nine hours you try to keep it lively, you try to insert some jokes here and there.” Ariana Grande is of Italian, not Latin, descent.